YUV Convert is a video conversion and processing software. Since YUV Convert is certainly the tool which proposes the most important number of processing possibilities for uncompressed YUV files, it is a reference tool for these types of files. YUV Convert is a software product. It works under any Windows version (XP, Vista, Seven, 8, 8.1, 10 and Server editions) and is very easy to install (you just have to run the installer and click on "Next..." several times). If possible, the recommended configuration is: 4-core CPU, 3 GB of RAM, 5 GB of free hard disk space. YUV Convert can run on virtually any PC. It can even run on a laptop. At start up, YUV Convert displays a window showing two preview frames: one for the input video and one for the output video. To start using YUV Convert, you generally click a "Browse..." button in order to select an input video file that you want to convert. YUV Convert also supports HDR (High-Dynamic Range) formats OpenEXR and RGBE. HDR images can be converted in uncompressed YUV videos. This conversion can be made linearly or using Perceptually Uniform (PU) encoding for optimal viewing experience. Lists of images in OpenEXR (*.exr) or RGBE (*.hdr) formats can also be converted to uncompressed AVI video files. In fact, you can choose between using the integrated decoders or using DirectShow decoders. So if you can play your video files in a media player (like Windows Media Player, or Media Player Classic, etc...), then you can use YUV Convert with these files. Videos can have any duration, any frame rate and any frame size. 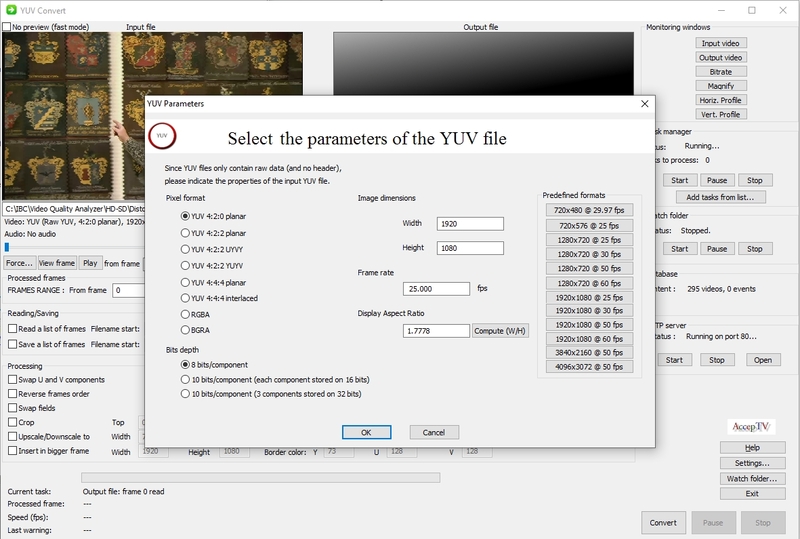 YUV Convert also supports uncompressed YUV formats as input (4:2:0 planar, 4:2:2 planar, 4:2:2 UYVY, 4:2:2 YUYV, 4:4:4 planar). And if your videos are Multi Program Transport Streams (MPTS), you can select the audio and video streams that you want to process. Once a video is loaded, its first frame is displayed. Its video parameters are also displayed: codec, frame dimensions, frame rate, number of frames, duration, audio sampling rate, audio duration, etc. If one or several parameters were badly parsed from the file (this happens sometimes with non-standard compliant applications or broken files), all the parameters can be manually forced. For both the input and output videos, the interface also supplies a slide bar to seek to a particular frame. You also have buttons that enable you to view a given frame or play the video. YUV Convert also supports other formats like RGBA and BGRA. The input video can even be a list of images, each image being in uncompressed YUV format or in BMP format (24-bit uncompressed BMP). To use BMP format, the file extension should be ".bmp" or any upcase or downcase equivalent (".BMP", "BmP", etc.). You should also click on the check box to indicate that the input video is a list of images. And don't worry about the syntax of the filenames because YUV Convert can guess it! For example, images with the following filenames can be used: "Frame0000.bmp" to "Frame1234.bmp", or "Image100capture.bmp" to "Image300capture.bmp". You can also decide to convert only a portion of the input video. To do this, you can enter the numbers of the start frame and end frame. Or you can use the slide bar and the "S" (for start frame) and "E" (for end frame) buttons. YUV Convert also proposes a button to select all the frames. 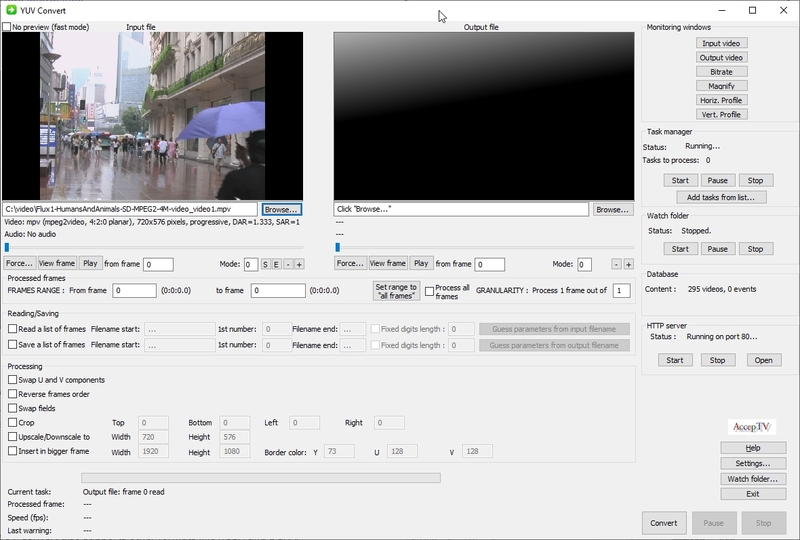 Once you have chosen the input and output video files, and when you have defined the range of frames to process, just click the "Convert" button and the video conversion will start. 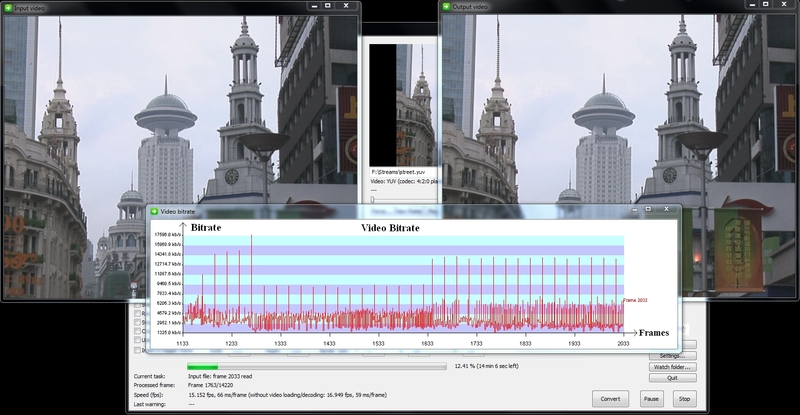 During the video format conversion, the video bitrate is measured and the bitrate curve can be shown. The input and output frames which are being processed can also be shown during the video format conversion. YUV Convert can also be used for other purposes than video format conversion. Indeed, if you load two videos (as input and output), then you can show two frames (one of each video) and see the content of these frames in a magnifying glass. 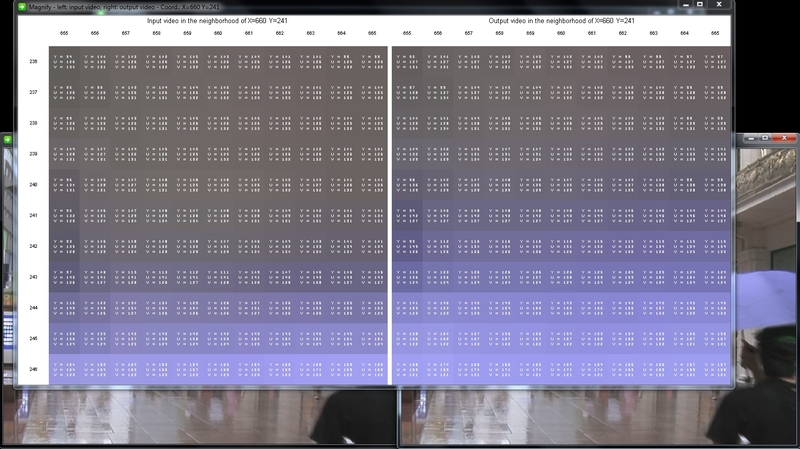 The magnifying glass enables to inspect the video frames and see the YUV values for each pixel. That's a very convenient way to subjectively compare two videos (at two different bitrate for example). Comparing two videos can be very useful when benchmarking encoders or decoders. The displayed area is the neighborhood around the mouse cursor. So it is updated when you move your mouse. In the same way, YUV Convert can draw the horizontal and vertical profiles of the Y, U and V signals for the two loaded videos. Like the magnifying glass, the displayed area is the neighborhood around the mouse cursor. So it is updated when you move your mouse. In the web interface, YUV Convert shows the list of all the videos which have been processed. The parameters (duration, dimensions, etc.) of each video are also indicated. Administrators can remove videos form the internal database. 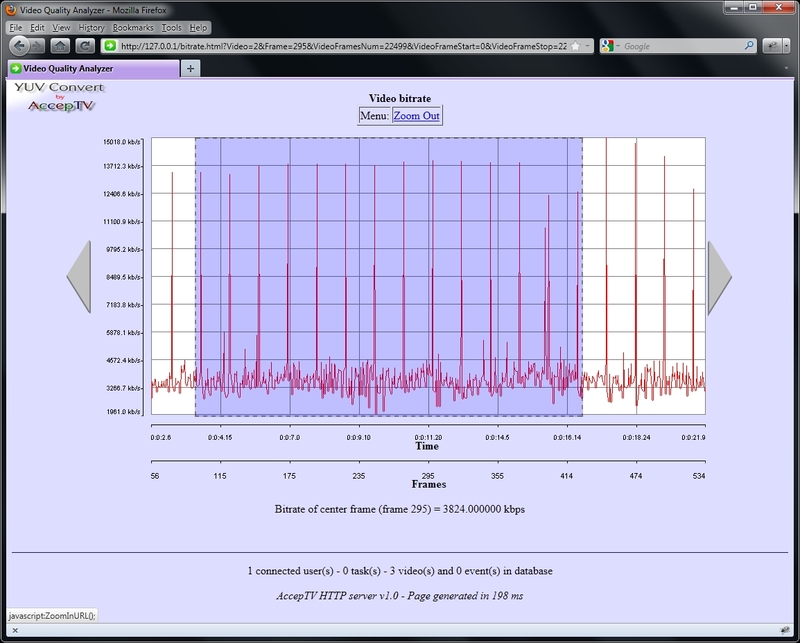 In the web interface, YUV Convert can show you the video bitrate curve. This curve is interactive: just select a portion of it and YUV Convert will zoom on this area. 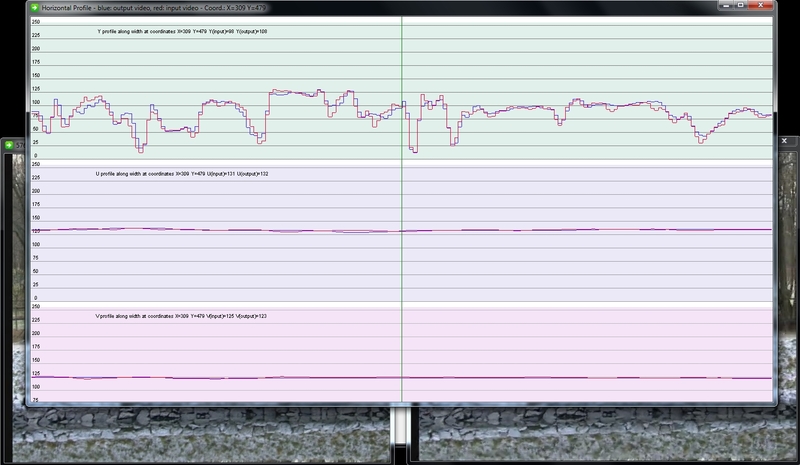 The value of the video bitrate at the center of the curve is also displayed. en utilisant le Watch Folder qui surveille un dossier (et ses sous-dossiers) de manière à traiter tout nouveau fichier y apparaissant. With all these unique features, YUV Convert is a must have product for all companies working with files in uncompressed YUV formats: broadcasters, video equipment manufacturers and content providers. YUV Convert is definitely a reference tool for these types of files.